I haven't posted here for a while. Thanks for the two comments that were left in the interim. Thank you. No doubt that this passion I have for tall buildings is phallic. But I wasn't aware of this new structure, currently called "Lakhtta Centre" which is being built in the beautiful city of St. Petersburg in Russia. 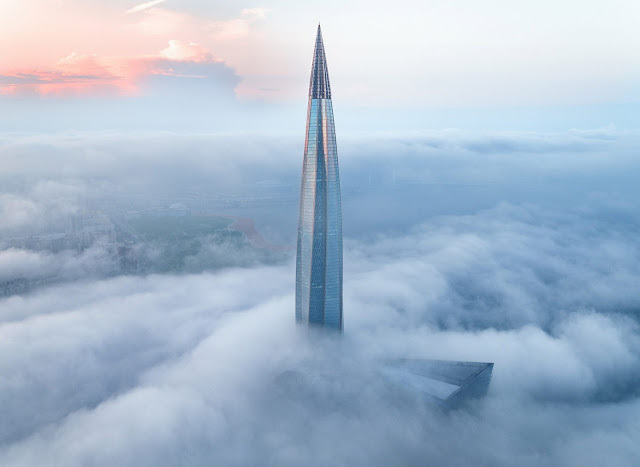 When finished it will be the tallest building in Europe at 87 floors, 462 meters high (1,516 ft.) The building, according to Dezeen, the design has a 90 degree twist from foundation to tip. It was designed by "British architect Tony Kettle designed the tower during his tenure at RMJM, before handing the project over to Russian architects Gorproject to complete." It continues a trend of "spire" skyscrapers (London's Spire, Shenzhen's new super tall building and others) that are being built. I love the continued evolution and beauty of architecture in the world. The US was once the leader for these structures. Sadly, we have become very low on the totem pole of architecture height distinction and building design. It illustrates the decline of our country in so many things in this Trump-era.